Sometime between her October 1910 marriage and 02 April 1911 (British 1911 Census), the new Madame E. Guérin arrived in England with her daughters. In this Census, Raymonde & Renée are pupils boarding at the private ‘Girton House’ school for girls, Ealing. 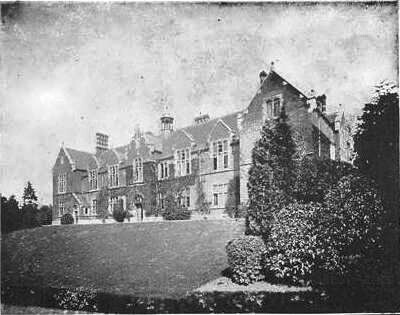 Madame Guérin placed her two daughters at Girton House School for Girls, Ealing, London. 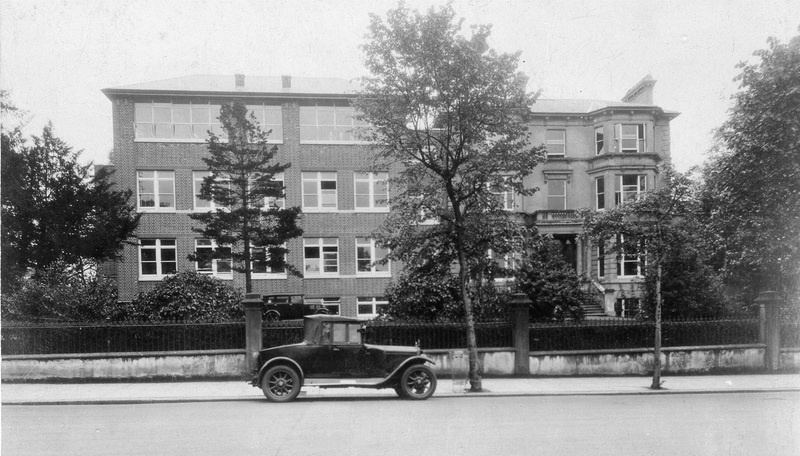 Image owned by (& courtesy of) Notting Hill and Ealing High School Archives. With Eugène returning to the Sudan soon after their marriage, Britain is where Anna began her new career – that of an artistic lecturer, under the auspices of the ‘Alliance Française’ organisation (see Chapter 4). 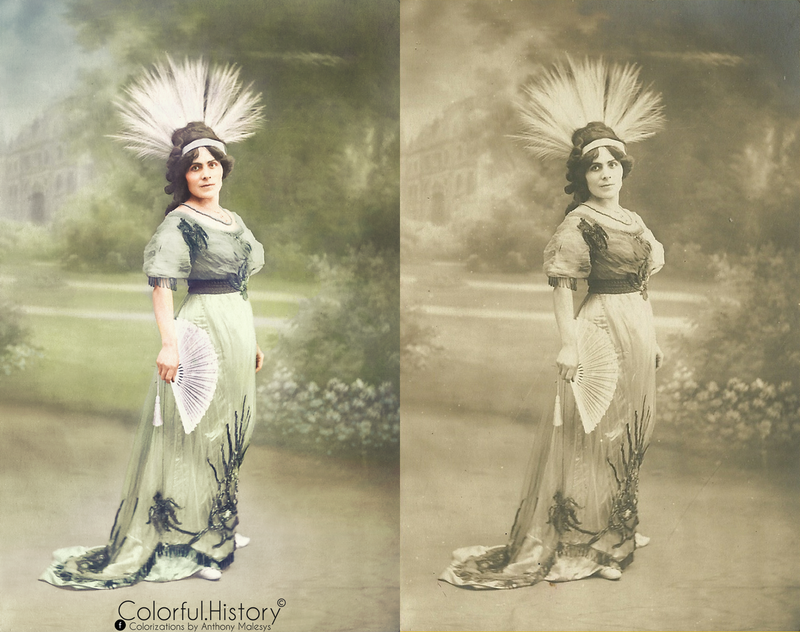 Anna used limelight views to illustrate all her performances, which were all given in French and in costume. Raymonde and Renée’s ‘Girton House’ Girls’ School is the earliest known venue for their mother’s debut on the British lecture circuit. On Friday 2 June 1911, Madame Guérin performed her second lecture at ‘The Université des Lettres française’, Marble Arch House, London (near Connaught Place) – under the name of “Sarah Granier”. Throughout her professional life, Madame Anna Guérin was often proclaimed as “the Sarah Bernhardt of the lecture platform” (Sarah Bernhardt being the famous French stage and film actress of the time). There was also another famous French actress called Jeanne Granier – perhaps Anna Guérin combined the two? That said, coincidentally, “Granier” was Anna’s mother’s maiden name. Whatever the back-story, Anna created “Sarah Granier” as her artistic stage name. ‘The Université des Lettres française’ had only opened in 1910 – it is now known by the name of ‘The Institut français du Royaume-Uni’. 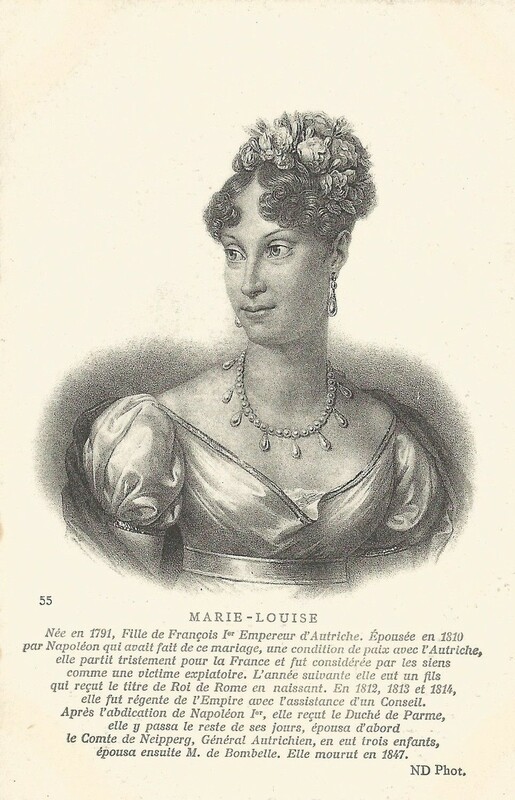 The Université was the initiative of a young French woman, Marie d’Orliac – she was keen to introduce London society to well-known French artists, writers etc. King George V and his wife Queen Mary were on the British throne at the time (they would be crowned on 22 June 1911) … it is reported that Anna Guérin performed in front of British royalty, perhaps Queen Mary was in the audience at her lectures at Marble Arch House? “A Lady’s London Letter. WEDNESDAY EVENING. … And one of the most charming and refined of these side-shows are the matinees by Madame Sarah Granier, given at the Marble House, opposite Marble Arch. The entertainment is a series of lectures by opera airs and ballads—the lecture by Madame Granier, and the singing by Mdlle. Marietta Amsted the new and delightful Swiss soprano. The subject of the conferences is the Napoleonic era, treated mostly from a character point of view, and giving what I may call a domestic sketch of the two Emperors, their families, and mode of living. Madame Granier, the officier d’Academie, has made her subject a special study for some time, and has gathered a wonderfully interesting number of anecdotes and other ana, which she relates with great charm, and in the most exquisite French. Her first conference was on the two Empresses, Josephine de Beauharnais and Marie Louise. Mdlle. Amsted sand the songs, ballads, etc., of the period, most beautifully. She wore the costume of the time, one being a gown worn by a lady of the Court who was present at the execution of Marie Antoinette. At the second matinee, June 2, the subject was the celebrated women of the Empire, the Sisters of Napoleon—the lectrices, and the actresses. Mdlle. Marietta sang, among other items, “Voice le printemps,” by L’Abbe Rose, a lovely, inspiriting air, charmingly rendered. If Anna did “rejoin” her husband Eugène (wherever he may have been on the African continent), perhaps it was in 1912 … that may explain why nothing much has been found on her during that year? “A dinner party was given on Friday night by Lord and Lady Ashby St. Ledgers at Wimborne House and Lady Noreen Bass, Lord Algernon Gordon-Lennox, with his daughter Miss Ivy Gordon-Lennox, Lord and Lady Hugh Grosvenor, Lord and Lady Guernsey, Captain Harold and Lady Norah Brassey, Captain and Mrs. Naper, Mr. and Mrs. Caryl Baring, Mr. and Miss Mitjens, Mlle. de Escandon, Miss Muriel Wilson, Mr. and Mrs. Hwfa Williams, Major Atkinson, Mr. Riversdale Grenfell, Captain Herbert Wilson and Mr. Evelyn de Rothschild. On 14 November 1911, Madame E. Guérin gave a lecture at the Bedford Grammar School during the afternoon. 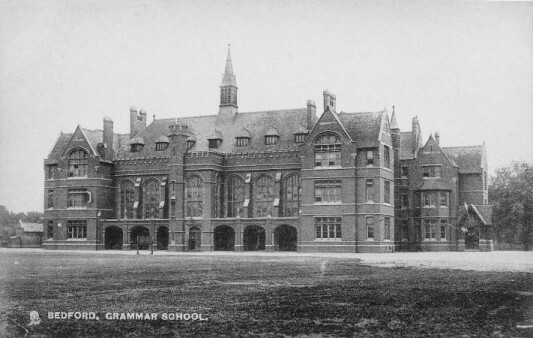 Madame Guérin lectured at Bedford Grammar School. Courtesy/© of Heather A, Johnson. “A LECTURE IN FRENCH. – The gallery of the physical laboratory at the Grammar School was well filled with an audience mostly of young people from the Schools, who came on Tuesday afternoon to hear a lecture on Madagascar, by Madame E. Guérin, Officier d’Académie who has lived in that country twelve years. The lecture was given in French, and, as it was also illustrated by limelight views, our reporter pleads that the twilight of the occasion is quite sufficient explanation of why his notes are not so elaborate as usual. Madame Guérin commenced with some graceful references to the “grande réputation des écoles de Bedford,” and proceeded to give, in a fairly clear and deliberative flow of diction, a graphic description of Madagascar and of “les Malgaches,” which we understand is the appellative of the inhabitants. After referring to the voyage of three weeks, and the places touched at en route, Madame Guérin indicated the geographical situation of Madagascar, mentioning the states and colonies on the opposite coast of Africa. Some idea of the size of the island was given by making comparisons with European countries, and then the mountain ranges, plateaus were described – not forgetting the climate, which seems to be rather warm. Birds, trees, herbs, minerals – nothing was omitted. The first picture gave a view of a river with its rocks and surrounding luxuriance of vegetation. The ports-of-call en route to Madagascar that Anna described were likely to have been:- Malta; Port Said (Egypt); Suakin (or Sawakin, Sudan) Djibouti; Sansibar (Zanzibar); & Mozambique. N.B. “Tananarive” =Tamatave = Toamasina. Slowly, Anna Guérin was increasing her workload & popularity. Her lecture themes changed after 1911, dropping the subject of ‘Madagascar’ in favour of the French women of history – namely, “Heroines of the French Revolution” (Marie Antoinette, Charlotte Corday and Madame Roland of Bordeaux); “Jeanne d’Arc”; and “The women of Napoleon I” e.g. Josephine Bonaparte. Her performances received glowing reviews, wherever she lectured. Adjectives used to describe Anna conjure up a feast for the imagination, e.g. eloquent; audience moved to tears; declamatory force; vivacious; excellent feeling; graceful; intellectual treat; dramatic; celebrated; expressive; attractive; sympathetic; vigorous applause. 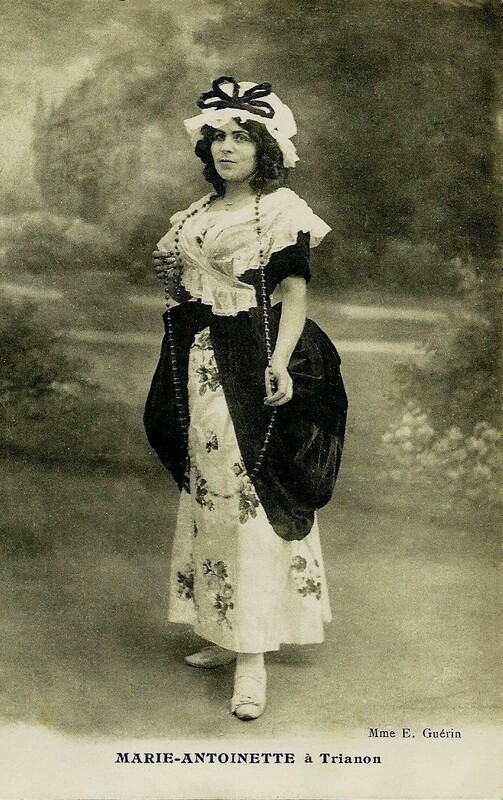 Madame Guérin as Josephine Bonaparte à La Malmaison. Courtesy/© of Heather Anne Johnson. On 23 November 1912, (as advertised below) the Bath Chronicle & Weekly Gazette printed an advertisement ahead of three lectures to be given by Madame E. Guérin in Bath, Somerset: “Mme. E. GUERIN (Who has already given 400 French Artistic Lectures all over England) will give THREE FRENCH ARTISTIC LECTURES (in Costume of the Period) From 3 to 4 p.m., on the following Wednesdays: NOV. 27th, DEC. 18th, and JAN. 22nd. Particulars at Milsom’s.” “Milsom’s” was the Milsom Hotel in Bath – it is logical to assume that this may have been where Anna Guérin stayed, during her visits to Bath. On 27 November 1912, Anna Guérin gave her 1st lecture (of a series of 3) at the Bath Assembly Rooms – headed ‘Jeanne d’Arc, Heroine and Martyr’. 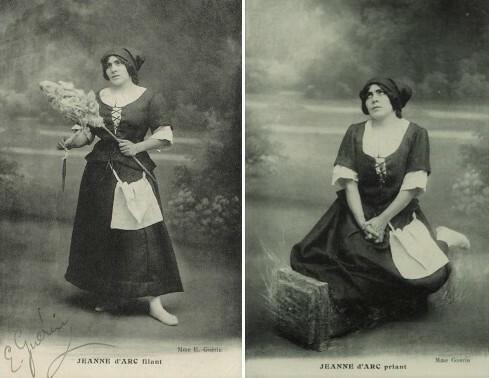 Madame E. Guérin portraying Jeanne d’Arc. c1911. Courtesy/© of Heather Anne Johnson. Shown above are two of the souvenir postcards that Madame Guérin would hand out at the end of her lectures. Here, she is portraying Jeanne d’Arc … “filant” (spinning) and “priant” (praying). Jeanne was a daughter of farmer Jacques d’Arc and wife Isabelle Romée – Jeanne would help tend the sheep for her father and help spin the wool for her mother. Jeanne was renowned for her praying. “FRENCH LECTURES IN BATH. JEANNE D’ARC, HEROINE AND MARTYR. On 03 December 1912, Madame Guérin gave an evening lecture in Edinburgh, the subject being “Les Impératrices de France” – Emperor Napoleon’s women – Marie Louise and Josephine. Empress Marie Louise Bonaparte. Courtesy/© of Heather A. Johnson. “HEROINES OF THE FRENCH REVOLUTION IN BATH. Having in her previous lecture, which was given at the Bath Assembly Rooms on November 27 , dealt with romantic and tragic career of Joan of Arc, Madame Guerin in her second lecture, which was given at the Bathwick Ladies’ Scholl, Pulteney Street, on Wednesday afternoon, described the careers of two heroines of the French Revolution – Madame Roland, of Bordeaux, and Charlotte Corday, who from her assassination of the tyrant Marat in his bath, is probably better known to the casual student of French history. Madame Guerin, whose remarks were exceedingly easy to follow, wore a costume modelled on that which the patriot, Charlotte Corday, wore at the time of her execution. Charlotte Corday. Courtesy/© of Heather Anne Johnson. “FRENCH LECTURES IN BATH. LAST OF THE SERIES. On Wednesday afternoon Madame E. Guerin gave the last of her series of three lectures in French which she had arranged to deliver in Bath at intervals of approximately a month. The first of the series was given at the Assembly Rooms last November. The second was given just before Christmas and, like the third, was delivered at the Bathwick Ladies School, Pulteney Street, of which Mrs. Peach is the principal. Considering the weather, the concluding lecture was well attended. Madame Guerin, who wore a costume of the period of the Empire, had chosen as the subject of the last lecture, “The Empresses of France. The wives of Napoleon – Josephine and Marie Louise.” The lecture lasted about an hour and a quarter, and Madame Guerin again displayed considerable charm of manner, and a decided sense of humour, while she occasionally adopted inflections usually employed in the singing of French songs. On 26 June 1913, The Hull Daily Mail informed: “OBJECTION TO FRENCH LECTURE. A discussion arose at the meeting this afternoon of the Hull Education Committee on the resolution of the Higher Education Sub-Committee to permit Miss Rowland, of the Secondary Girls’ School, to arrange for a French lecture to be given the pupils by Madame Guerin, at a fee of £3 3s. Mr. Coult raised an objection, and said that the ratepayers were getting tired of extra payments. Mr. Dixon stated that the lady French lecturer mentioned had excellent credentials, and she had arranged to give a lecture at Hymers College and also at the Grammar School. He explained that at the Grammar School her lecture was on the French Revolution, with costumes and with lime-light effects. The Chairman (Councillor Dawson) said that application was made to the Higher Education Committee by Miss Rowland, and after making enquiries into the credentials of the lecturer, the application was agreed to. Canon Lambert remarked that in the opinion of the Sub-committee it would be of educational value and of immense use to the girls that a lecture should be given by a French lady in French. A time when the French President was in London was scarcely the time for the Education Authority to go out of their way to limit the acquaintance of the rising generation with the French language. On 27 June 1913, The Yorkshire Post and Leeds Intelligencer ran this article: “HULL EDUCATION COMMITTEE AND A FRENCH LECTURE. At a meeting of the Hull Education Committee yesterday, Councillor Coult protested against what he called the waste of the ratepayers’ money in paying a fee of three guineas* to Madame Guerin for a French lecture to be given to the pupils of the Central Secondary School. The Chairman (Councillor Dawson) said the subject would be the French Revolution and several members spoke of the excellence of Madame Guerin’s credentials. Madame Hatton-Edwards could often be found in the newspapers … carrying out and arranging artistic performances. It is assumed that she ran a private school as it was reported in the articles that her pupils performed “admirably” and “splendidly”. 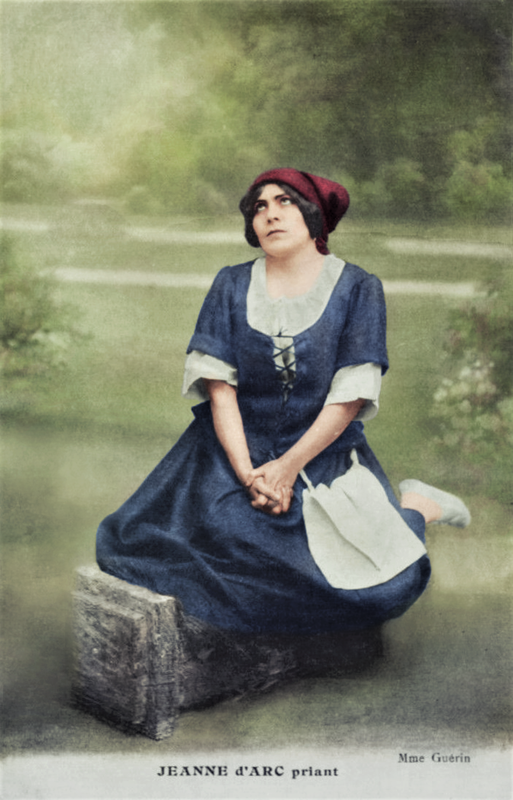 Madame Guérin as Jeanne d’Arc – priant/praying. Courtesy/© of Heather A. Johnson & Colorised by Anthony Malesys. “Madame Récamier” was Madame Jeanne-Françoise Julie Adélaïde Récamier (née Bernard – best known as “Juliette”) – she was a French socialite beauty, feted by Parisian high society. When “Juliette” was 15 years old, she married 45 yr old Jacques-Rose Récamier. “Juliette” was born on 3 December 1777, in Lyon and died on 11 May 1849, in Paris. “Chateaubriand” was François-René de Chateaubriand, a celebrated French writer … Madame Récamier and Chateaubriand had a relationship, they became a “couple”. “FRENCH LECTURE IN BELFAST. The life of Marie Antoinette. Yesterday, in the Common Hall of Victoria College, Belfast, Madame Guérin gave a most interesting address in French on the life of Marie Antoinette. There was a full attendance of the staff and also of the students, who listened with the greatest interest and attention and followed with ease Madame Guérin’s vivid and dramatic sketch. This is a striking illustration of the advantage of the modern “direct” system of language teaching. Madame Guérin, wearing the picturesque shepherdess costume assumed by Marie Antoinette, described with much vivacity the fairy-like village of Thianon, where the unfortunate Queen, through her extravagance, raised against her the bitter anger and hatred of her subjects. The salient points of her life and surroundings were charmingly portrayed and illustrated by many personal incidents throwing side-lights on the Court life of the time. A cordial vote of thanks was proposed by Mademoiselle Oppiger, and seconded by Miss Finnegan, B.A. In acknowledging the vote, Mme. Guérin complimented the pupils very warmly on their mastery of the foreign language, and said she had been touched by the eager and sympathetic manner in which they had listened to her lecture. 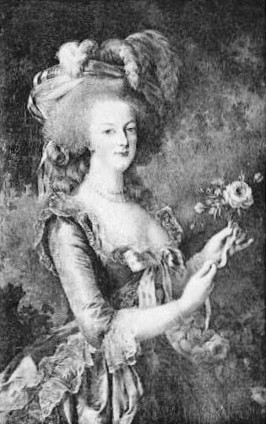 Madame Guérin as Marie Antoinette à Tiranon. Courtesy/© Heather Anne Johnson. “MADAME GUERIN ON MARIE ANTOINETTE. At the Lodge, Fortwilliam Park, yesterday afternoon the pupils of the school and others had a rare treat in listening to a lecture by Madame Guerin on Marie Antoinette. The style of the lecturer, who wore the costume associated with that ill-fated Queen, is so dramatic, her enunciation as clear, and her entire manner of delivery so exceptionally fine, that it was possible for those with even a moderate acquaintance with French to forget they were being addressed in a foreign language. The story of the fifteen year old Princess who was oppressed by the burdensome and absurd etiquette of a foreign Court, harassed by responsibilities so unsuited to her age, and who mocked the former and disregarded the latter was listened to with the utmost interest by even the youngest children present. The lecturer dealt with the careless gaiety of the young princess—her warm-hearted generosity, her lack of wisdom, her frivolous, giddy life at the Trianon, her many friendships with those of tastes and age corresponding to her own, and the homage of the people so soon to change into pitiless, hatred, and withering scorn. It was then shown how the French nation, so long starved and oppressed, forgot that Louis XVI and his Queen were perhaps more the victims of their circumstances than the victimizers of others; but, at all events, as with another princess brought up in the French Court, and transferred to Holyrood in Scotland’s sternest age, people of to-day remembered more the tragic fate of Marie Antoinette and Mary Queen of Scots than they did the follies or transgressions of these ill-fated sovereigns, who paid with their lives for the calamity of being unable to discharge the duties of those positions in which fate had placed them. Marie Antoinette, going to the scaffold in her peasant’s dress, had left an imperishable name in history, and had, with other sovereigns, shown that same fortitude in face of disaster and death which had thrown a halo around humanity alike when seen in the Grass Market o Edinburgh, in the burning coal-pits of Wales, on board the Birkenhead or Titanic, or amid the snows of the Polar regions. “LECTURE ON NAPOLEON BONAPARTE. Madame Guerin at the Technical Institute. A lecture, entitled “Les Légendes de l’Aigle Napoléon,” was delivered last evening before a crowded audience in the Central Hall of the Municipal Technical institute by Madame Guérin, officier d’instruction publique, the lecture having been arranged by direction of the Library and Technical Instruction Committee. The audience included a large representation of the language students of the Institute as well as groups of pupils from most of the secondary schools in Belfast. The platform of the hall had been tastefully draped and special lighting arrangements installed for the occasion. Mr. H. G. Fleet, lecturer in modern languages at the Municipal Technical Institute, speaking in French, expressed the pleasure with which the audience looked forward to hearing a lecture on the interesting subject which had been selected, and on behalf of the meeting gave the lecturer a most cordial welcome to the Institute and to Belfast. Madame Guérin, who was attired in the style of the Napoleonic period, and who spoke in French throughout, stated that Belfast was the first city in which she had lectured in Ireland. She mentioned that she had appeared in over 600 schools in Great Britain, and she assured them that rarely in her journeying had she seen an institution so complete in every respect as that in which she was now speaking. She congratulated the city of Belfast on the possession of such a splendid Technical School. Proceeding, Madame Guérin sketched the early life of Napoleon Bonaparte, making reference to his birth-place in Corsica, his family, the surroundings in which he lived, and the circumstances under which he passed by means of a scholarship to the Military School at Brienne. She described in graphic terms his career as a student, and referred to the opinions held on him by the various masters under whose charge he passed, mentioning that the subjects in which he was specially competent were those of mathematics and military science, and that modern languages had little attraction for him. The lecturer then passed on to describe Napoleon’s life at Valence, where, as a sub-lieutenant of artillery, he passed some portion of his life after leaving the military school. She sketched the activities of Napoleon through the French Revolution, his marriage to Josephine Beauharnais, his appointment to the command of the army in Italy, his victories in that country, and his triumphal return to Paris. She next gave an outline of the campaign in Egypt and of the various European coalitions which were formed against Napoleon, and described the preparations made for the proposed attack on England and the assembly of the French army at Boulogne. The subsequent military operations leading up to the ill-fated expedition into Russia, and the retreat from Moscow were next dealt with, the lecturer terminating this portion of Napoleon’s life in St. Helena, and his death. The lecture concluded with a series of admirable lantern views, projected on the screen, illustrating various incidents in the life of Napoleon, from his boyhood onwards, a brief description being given of each view. The discourse from beginning to end was most interesting. The lecturer was quite remarkable for her clearness of enunciation and for the dramatic gestures with which she aided her graphic descriptions of the various incidents. Monsieur André F. Magaud, who also spoke in French, in a few happily chosen phrases, concevey [conveyed] to Madame Guérin the thanks of the meeting for her lecture. The sustained applause with which the proposition was received gave evidence that the meeting was one of the most successful held in connection with the language classes of the institute. 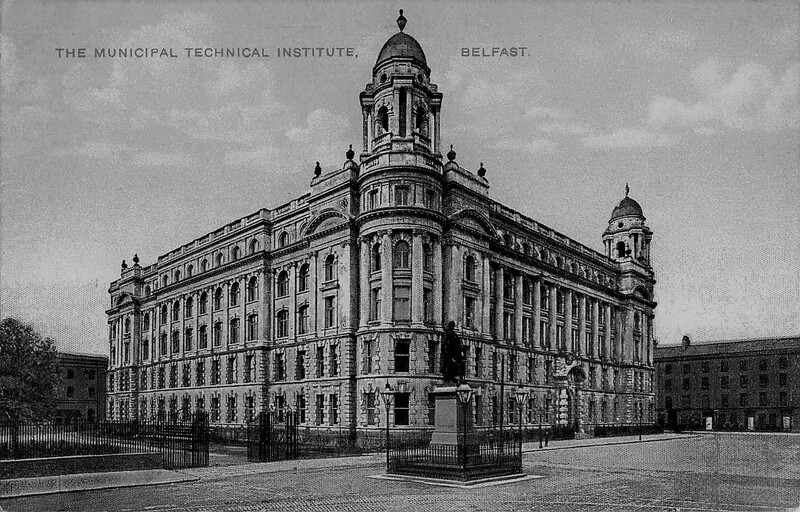 The Municipal Technical Institute, Belfast. Courtesy/© of Heather Anne Johnson. “BEDE COLLEGIATE SCHOOLS. LECTURE BY MADAME GUERIN. Yesterday afternoon a delightful lecture, in French, on Napoleon, was given to about 300 boys and girls of the upper and middle forms of the Bede Schools by Madame E. Guerin, an accomplished French lady. There being no large room in either of the schools Mr. Walter B. Allan, one of the governors, kindly hired the Subscription Library Hall for the occasion. Madame Guerin, attired as Josephine Bonaparte at the Malmaison, riveted the attention of her hearers while, for over an hour, in a most attractive manner she recounted the main events in the career, or described the principal characteristics, of her famous subject. With excellent judgment, she selected such matter as was likely to interest young people; and her agreeable voice, expressive looks and gestures; dramatic power, well-chosen words, clear enunciation, and comparatively slow delivery made her always intelligible to a very large part of her audience. The whole lecture well illustrated the charm, force, precision and delicacy of the French language, and also was very useful for the historical information which it supplied. Numerous lantern slides relating to the French Revolution and to Napoleon were exhibited. Madame Guérin portraying Josephine Bonaparte à La Malmaison. Courtesy of/© Anthony Malesys and Heather Anne Johnson. 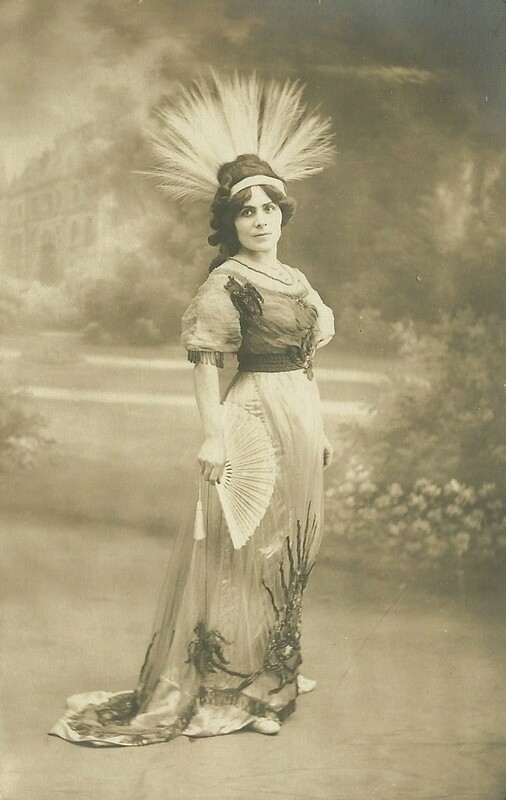 The Western Times (24 March): “A Compliment for Maynard’s School, Exeter … Madame Guerin wore the costume of the period with which her lecture dealt. Her dress — a skirt of rose-brocaded ivory silk, crimson velvet paniered overdress, and soft Marie Antoinette fichu* of white spotted muslin, worn with a big mob-cap of muslin and lace, trimmed with a wired crimson velvet bow – was a facsimile of one worn by the hapless Queen in the heyday of her life. The address took the form of a fascinating sketch of the history of Marie Antoinette, including her youth at the Austrian Court, her arrival in France, and her gaieties and escapades at Trianon. It finished with the grim tragedy of the Revolution, the whole illustrated by a wealth of finely dramatic gesture. There was a large audience of students and Governors and friends of the school. In response to the enthusiastic applause that rewarded her address Madame Guerin, having retired, made a reappearance in the Conciergerie** dress of Marie Antoinette – a black skirt and loose white blouse, with the Tricolour cockade fixed in her cap. In the course of a charming and humorous speech of appreciation, delivered in French, she complimented teachers and scholars alike upon the excellence of their French tuition, as evidenced in the interest with which the girls had followed her story. She had, she observed, given French lectures in some 640 schools, so that she was experienced in audiences. The Maynard School gathering had obviously so readily understood all that she had said that she had quite forgotten in the course of her lecture that she was addressing English and not French people. A vote of thanks to Madame Guerin was moved in cordial terms by Miss Montgomery, and heartily accorded.” *fichu = a small triangular shawl, worn round a woman’s shoulders and neck; **Conciergerie = Conciergerie Prison, where Marie Antoinette was held prisoner. Madame Guérin lectured at Maynard School, Exeter. Courtesy/© of Heather A. Johnson. Exeter and Plymouth Gazette (24 March) [sic]: “MARIE ANTOINETTE. LECTURE AT EXETER. There was a good attendance at Maynard School, Exeter, yesterday afternoon when Madame E. Guerin (Sarah Granier), Officier d’Instruction Publique, lectured on “Marie Antoinette.” The whole of the proceedings were in the French tongue. Madame Guerin, who is a well-known character lecturer, wore a costume of the period, and her short, but interesting recital of the important incidents in the tragic life of the French Queen was listened to with great attention. Madame Guerin treated the subject sympathetically. She did not criticise Marie Antoinette’s character to any extent, but contented herself with acting in gesture and expressing the life of Marie Antoinette with a feeling that suggested the deep tragedy that ran through the period of the French Revolution. Marie Antoinette was a mother as well as a woman of pleasure; she might have loved the gaiety and the spirit of youth, but she was a creature whom fate overshadowed, and her destiny included the terrible finale of the guillotine. At the conclusion of her lecture Madame Guerin was vigorously applauded. She retired, and returned in the dress of the Conservatoire. N.B: Anna is said to have received the French decoration of “Officier d’Instruction Publique” from the French Ambassador to London. On 28 June 1914, Archduke Ferdinand (the heir presumptive to Austro-Hungarian throne) was assassinated at Sarajevo and this set in motion the chain of events that led to the First World War. In short: early in August, Germany declared war on France and invaded Belgium; then Great Britain declared war on Germany (thus, all the British Empire countries were at war also); and, on 23 August, Germany invaded France. Anxious and tragic times lay ahead for all the nationalities involved. The Allies fighting for civilization. Courtesy/© of Heather Anne Johnson. On 03 October 1914, Anna left Liverpool for the USA. She was a passenger on the ship ‘Lusitania’ and arrived in New York on 09 October. Anna’s daughters remained at boarding school, under “the supervision of her aged mother”. Months earlier, it was recorded that Anna intended to go to America and work as a lecturer so she always planned to make the visit. On the ship passenger list, her nearest relative was given as “E. Guerin, 33 Rue Franklin, Lyon, France”. 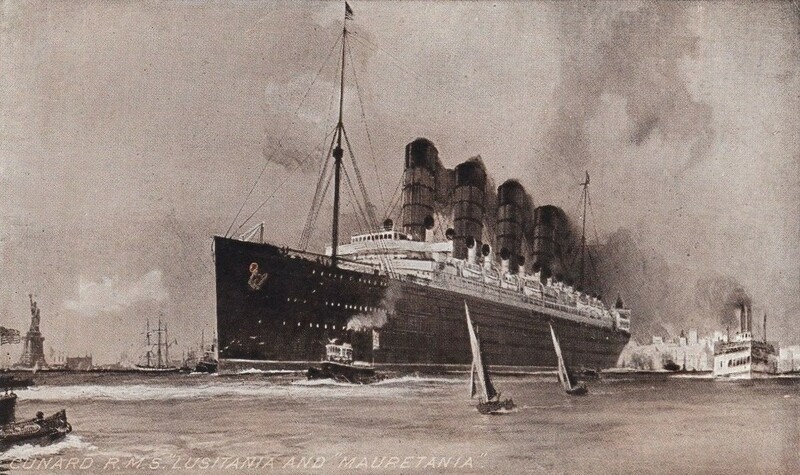 RMS Lusitania, with sister-ship RMS Mauretania in the distance. Courtesy/© of Heather A. Johnson. Eugène was born 01 March 1870 – in Guebwiller, Alsace-Lorraine. His parents were Commissionnaire (Agent) Eugène Louis Guérin and Barbe Justine Abt. France had lost Alsace-Lorraine to Germany the same year Eugène was born. The area was officially annexed into the German Empire on 01 January 1872. Residents could decide who to live under and many families moved from Alsace-Lorraine into France. When he was 2 yrs old, Eugène was declared a French citizen on 13 April 1872, whilst living in Belfort, France – (Franche-Comté region), which lies between Lyon and Strasbourg. Eugène’s parents and two sisters became French citizens at the same time. 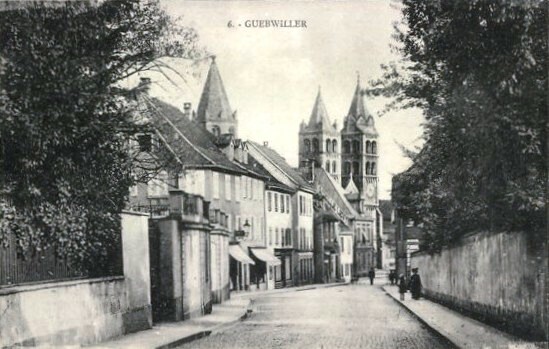 Guebwiller, Alsace-Lorraine – birthplace of Madame Guérin’s husband Constant Charles Eugéne. Courtesy/© of Heather Anne Johnson. Eugène’s education resulted in him obtaining a law degree and becoming a ‘Bachelor of Letters’. He had been a former student of the ‘l’École libre des sciences politiques’. (Grades universitaires: Bachelier ès-lettres, licencié en droit, ancien élève l’École libre des sciences politiques). In 1896, Eugène became a Solicitor Clerk and, then, a lawyer to the Court of Appeal of Paris on 30 March, 1898. On 01 August 1903, the ‘Journal officiel de Madagascar et dépendances’ announced that Eugène Guérin had been appointed to a post near Diego-Suarez, a port in the north of Madagascar. On 13 September, the same newspaper informed the reader that Eugène Guérin had arrived in Diego-Suarez, on the post packet-boat ‘Iraouaddy’. On 25 June 1905, the ‘Journal officiel de Madagascar et dépendances’ printed a short notice that informed its readers that Eugène Guérin was moving on – he was to become Deputy Judge of the Court of Tamatave. On 19 November 1905, we know (from the J’ournal official de Madagascar de dependances 15 Nov.) that Eugène Guérin (amongst others) boarded the mail-boat ‘Iraouaddy’, bound for Marseille – no doubt for a vacation in France. On 05 January 1907, the ‘Journal officiel de Madagascar et dépendances’ announced more leave for Eugène Guérin – for a three-month convalescence leave on full pay, in France. On 22 June 1907, the ‘Journal officiel de Madagascar et dépendances’ announced that “Mr. Guérin, substitute judge, in Tamatave, was appointed lieutenant judge in Dakar”, in French Senegal. It is deduced that, by 27 July 1907, he had left Madagascar because his successor was in place. By October 1910, Constant Charles Eugène Guérin was working at Kayes – the capital of French Sedan. On the 17th of that month, he married Anna Rabanit (née Boulle) in Vallon. It was written within the marriage entry that the bridegroom was “juge de paix à compétence étendue” (Judge/Justice of the Peace with extended jurisdiction). He was “domicilié à” (legally resident at) the 8th arrondissement of Paris but “demeurant à” (staying at) Kayes – which was, then, the capital of French Sudan. As previously noted, Eugène was an attaché at the World’s Fair in Lyon in 1914. With his professional knowledge of the French colonies in Africa, he must have been an ideal person to be amongst the French contingent manning ‘Le Pavillon Des Colonies’ site at the Fair. 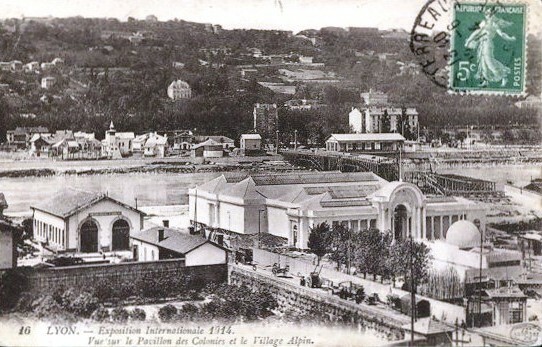 The 1914 World’s Fair in Lyon, France. Courtesy/© of Heather Anne Johnson. Because Austria and Germany shut their pavilions prematurely, there were hardly any countries still present at the official closure date. The unexpected early closure of the World’s Fair allowed Eugène to become part of an official mission to the Congo. Afterwards, Eugène served France in a totally different capacity – enlisting into military service during World War One. From facts written on a 1916 ship’s passenger list from one of Anna’s voyages, it is learnt that her husband Eugène had become an interpreter at a prisoner of war camp, at Saint-Rambert-sur-Loire – ‘Camp des Prisonniers Alsacien-Lorraine’. Documentation from 1921, confirms that Eugène had been mobilised on his request (“Mobilisé sur sa demande du 5 juillet 1915 …”) on 05 July 1915. It appears that ‘Camp des Prisonniers Alsacien-Lorraine’ at Saint-Rambert-sur-Loire opened in 1914 and was operational until January 1919. All Alsatian prisoners had the opportunity to make a voluntary commitment to the French army and it is reported that, in June 1915, a detachment of 70 prisoners left the Saint-Rambert camp to service France for the duration of the war. It is assumed that Eugène grew up speaking both the Alsatian and French languages and, as such, he would have been the ideal French citizen to fill the role of an interpreter at a Camp such as this. Reportedly, about 15,000 Alsations were taken prisoner. There were three special camps for them:- Lourdes (Hautes-Pyrénées); Monistrol-sur-Loire (Haute-Loire); & Saint-Rambert-sur-Loire (Loire). On 21 April 1921, according to the delegation of the Grand Chancellor, Constant Charles Eugène Guérin was announced as having been awarded the French title of ‘Chevalier de la Legion d’Honneur’. (Conformément à la delegation du Grand Chancelier, en date 21 Avril 1921 avons fait introduire M. Guerin nommé Chevalier de la Legion d’Honneur à l’effet de la récevoir en cette qualité). At that time, Eugène Guérin was Court President/President judge at Conakry, Guinea … “Président du Tribunal du Conakry”/“Juge président à Konakry, Guinée” [French Guinea, west coast of Africa] – he had completed 23 years of civil and military service for France. The reasons for being appointed ‘Chevalier de la Legion d’Honneur’ were given as follows: Court President at Conakry. Exposition of Lyon 1914. Secretary General of the Commissariat [police] of the Colonial section. Diploma of Merit. (Motifs de la Proposition: Président du Tribunal du Conakry. 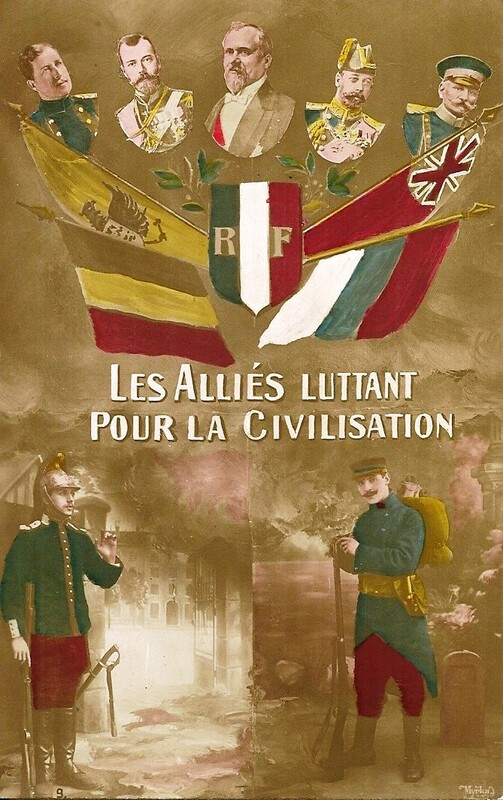 Exposition de Lyon 1914. Secrétaire Général du Commissariat de la Section colonial. Diplôme de mérite). Documentation from that time gave his address as 8 Rue du Mont Dore, Paris 17th arrondissement. On 13 June 1921, Constant Charles Eugène Guérin received his medal of the ‘Chevalier de la Legion d’Honneur’ in Paris, from the Grand Chancellor. It appears that Eugène Guérin spent all his working life serving the French government – his date of death unknown.